We’ve been blessed with a fairly warm autumn, so I hope you’ve been spending lots of time outdoors with family and friends. While there’s still a little time before the ground freezes, why not dedicate an afternoon to a little gardening work? This week, I have some tips for planting bulbs this month that will yield a gathering of beautiful spring flowers next year. 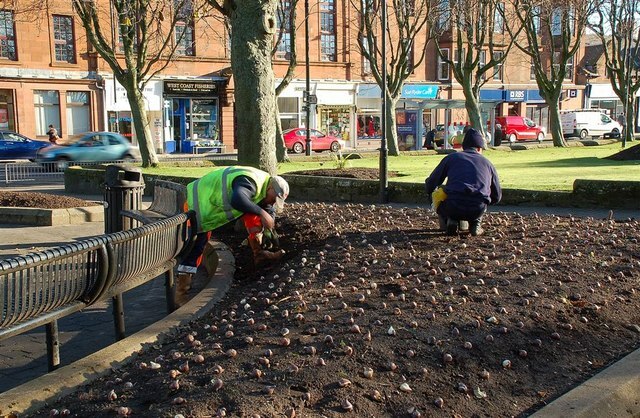 Before planting your bulbs, it’s necessary to make sure the ground is prepared for them. First, pull any weeds that have sprung up in your garden. Next, break up the soil with a hoe or shovel. Put a couple of layers of compost in your garden so your bulbs have protection through the cold weather months. It’s best to choose an area that receives four to six hours of sunlight per day. You can plant bulbs in late fall and even into early winter. The instructions accompanying each bulb will specify when they should be planted. It’s important to allow your bulbs enough time to establish roots before the ground freezes. What Bulbs Should I Plant? Tulips: Tulip bulbs should be planted about six to eight weeks before the first frost. Choose a place with well-draining soil where the flowers will get full sunlight in the spring. Do yourself a favor and choose bulbs that will yield tulips in a variety of colors. All through winter, you can look out the window and envision red, orange, yellow and pink tulips popping up next spring! Daffodils: They’re the surest sign of spring! It’s best to plant daffodil bulbs about two to four weeks before the ground is frozen. They do best in an area that receives full sunlight or partial shade. I’m always impressed when I see daffodils pop up in my garden with snow all around them. Crocuses: One of the best things about these bulbs is you can plant them almost anywhere except in the deep shade. Put them in the ground about six to eight weeks before the first frost. They need to be in a well-draining area of your garden. Last year, I planted some crocus bulbs near a pathway beside my home. I absolutely loved seeing their purple petals emerge late last winter. Other bulbs to plant in late fall and early winter include hyacinths, snowdrops, and irises. When Will I See My Flowers? The answer to this question depends on the types of bulbs you plant as well as the growing zone you live in. Daffodils bloom in late winter, while crocuses can come up in late winter or early spring. Tulips come up in early spring and hang around through May. Irises bloom in early spring as well. Plant a bulb three or four times as deep as its total width. If you can’t tell the top from the bottom of a bulb, plant it sideways. The stem will grow toward the surface. If you live in an area that doesn’t see temperatures below 45 degrees, put your bulbs in the refrigerator to pre-cool them. Leave them in the refrigerator for six to eight weeks before planting them. If dogs or other animals dig in your garden, protect your bulbs by placing chicken wire over them. Cover the chicken wire with two inches of mulch. Remember to take the chicken wire away in the spring before your flowers bloom. Planting bulbs now can inspire you to start planning other aspects of your lovely spring garden. With a little work now, you’ll have plenty of blooms to look forward to!